Following on from our Dementia Friends information session in May, we are delighted to announce a further opportunity for people to get a better understanding of the condition. We are hosting the event on Wednesday 28th November at 3.00pm at The Assembly House in Norwich. Private Client Solicitor and Dementia Champion Laura Rumsey, will be hosting the session with the aim of creating a better understanding of the condition and to also discuss ways that we can help both those living with Dementia and the families and friends who care for them. Laura will be joined by Jack Piper from Loveday and Partners, who will discuss planning for later life. 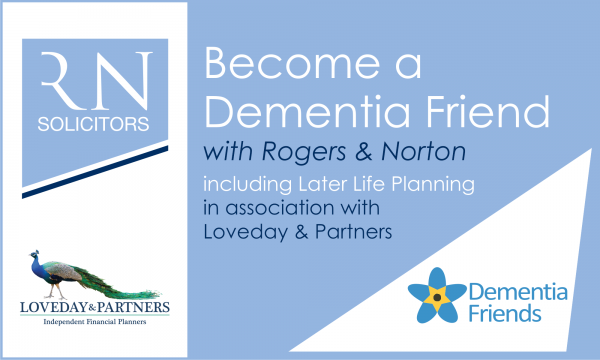 As a Dementia Friendly company Rogers & Norton are committed to helping and supporting vulnerable clients and their families or carers. We run these sessions regularly in both our offices in Norwich and Attleborough – if you are interested in attending please follow the link below, or if you wish to discuss a specific workshop for your company, please contact me for more details.